Well I found this really cool saying that I wanted to share with you. So when I clicked reblog it actually posted a different image of a saying that I had no intention sharing with you!!!! Here is the saying with the words that I wrote about it. I read this fun blog that usually has the bloggers pictures of her dogs or a random beautiful shot of a cake or a gorgeous dress. Today I saw one of her blogs and had to repost it. Here are some of my thoughts………. 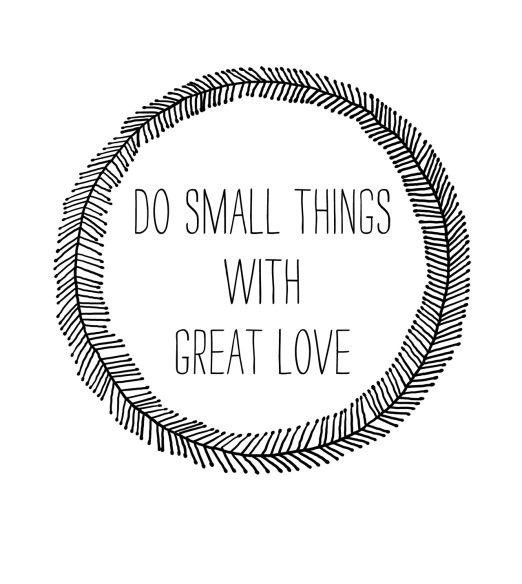 I was reminded today how important it is in the life of a mom to do small things with great love. We do a lot of little things throughout the day out of habit and necessity. Putting clean clothes away is another one of those chores that just has to be done that I loathe. I pray I can be that mom that shows great love in the monotonous things in life. Its sobering to think, but those moms and dads who have lost their children this past year, I am sure they wish they could do these “little things” for their children today. May our word and deeds be out of joy today with a thankful heart for the many blessings that we have.